Carrie's tulle skirt, love it or hate it, has finally peeked in mainstream everyday fashion. Spring/Summer 09 fashion trends has seemed to bring out the abundance of ladies wanting to adorn themselves in tulle skirts and dresses. And frankly, I am a little scared of what may come out of the woodwork with people trying to wear this trend. Elaborate and downright outlandish tulle first and foremost is for a certain kind of girl. If you don't have an ounce of Madonna flair about you probably need to think before you follow this trend. More conservative ladies wanting to participate in this trend, do it on a more conservative and light look with the tulle. For example, a skirt with a very light amount of tulle underneath...just to give it that little extra fullness. And by no means do any women who are older and wiser wearing tulle skirts. Yes you can be too old to wear a completely tulle skirt...sorry to rain on your parade, but I keep hearing women over 45 who want to wear tulle and I fear it is not a good idea. Curvy girl's beware too because too much tulle can have you looking like the wicked witch from "The Wiz." While I think that everyone can participate in this trend it is up to the person, their personal style, your body shape and their age on how they should wear this trend. Curvy girl's with smaller hips a fuller skirt can help you look more proportioned and balanced...it can give the illusion of an hourglass shape. Curvy girl's with full hips beware of too much tulle. 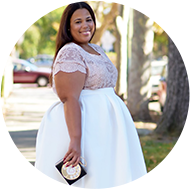 Because your hips and buttocks are already full a lighter amount of tulle will suffice because your hips will help create a fullness with the skirt. You can still show off your tulle in the spirit of the trend, but a little will go a long way with full hips. Jibri leopard jacket & tulle skirt - And yes thats me!